All of my children have gone through the Appletree Preschool and we LOVE the Preschool. They kids have so many opportunities for learning through their field trips and we adore our teachers who are all fantastic! Both of my boys who went through Appletree were MORE than prepared to start Kindergarten and I am so grateful to Appletree for everything they have done for my children! Our oldest child has attended Appletree Academy for the past 2 years. He is excited to attend school each day due to the fun and nurturing learning environment that has been cultivated by a staff that truly cares about each child’s best interest. We feel that Appletree has prepared him both academically and socially for success as he enters Kindergarten next year. Seeing the kids perform in special programs and attend field trips all over the city has really put Appletree above the rest and we are thrilled to enroll our youngest son at Appletree next year. 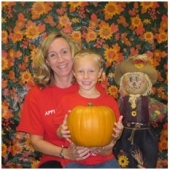 "Appletree Academy has been a part of my family for over twenty years. My sisters and I all attended Appletree Academy in the first few years Appletree was open. We couldn’t love it more! Jan is a great Director and even amazing person. Her dedication in getting to know the students and their families amazes me and makes me so happy knowing Bennett is truly being cared for by the best. "Appletree Academy has very loving teachers who are attentive to their needs. We felt our children were more than prepared for kindergarten! Very happy with our experience!" "My girls loved Appletree Academy! Both of my daughters, Claire and Ashlen attended Appletree. They enjoyed the great field trips and always came home happy. They learned so many things and were more than prepared for Kindergarten. As a mom, I appreciated the love and support of the teachers and the curb side pick-up was so helpful too!" "The two years my daughter spent at Appletree Academy were priceless. In my opinion they have a perfect balance of structure and fun and the kids learn so much. My daughter is more than academically ready for kindergarten and has the confidence and social skills to go with it. I am very thankful to Appletree Academy for all of the wonderful work they do!" "We enjoyed Appletree Academy for two wonderful years! I think the experience my son had at Appletree not only gave him the confidence to succeed in kindergarten, but also gave him a positive outlook about school in general. The field trips were all a blast and his teachers were so kind and enthusiastic about his progress. We can't wait to send our younger son to Appletree when the time comes! Thanks Jan!" John and Emily Mackie and "the boys"
"The great teachers made learning fun and easy for my daughter to understand. As a result, I saw how much my daughter has progressed the past 2 years, from being somewhat reserved and reluctant to participate, to being very involved and excited for the next school day! When children learn, and are eager to learn, you know the structure, curriculum, and teaching are challenging them in a positive way!" "Aleigh is more than ready for Kindergarten and will likely be ahead of her class thanks to the outstanding teachers at Appletree. She is reading, writing, and doing basic math. Not only did her teachers instill a love of learning in her, she is actually wishing her summer away so she can start Kindergarten!" "We have been a part of the Appletree Academy family for almost 10 years. We have four boys and each one has been through the two year preschool program. The teachers are warm and caring, yet firm and have great class management. The curriculum is well rounded and prepares the kids so well. Parents are welcome partners to help with fun activities and field trips throughout the year. We have loved each year with Jan and all the staff. It makes me a little sad this is our last year...almost wish I had another little one....almost!" "Nathan really enjoyed going to Appletree Academy. His teacher provided a warm, nurturing environment in which he could learn each day. With the skills he learned, he is now ready socially and academically to start Kindergarten---thanks Appletree!" "It has been fun to watch our son mature academically and socially. He has gained a confidence we were hoping he would have before starting Kindergarten. He is more than ready to start in the Fall! We are very pleased and thankful how Appletree Academy has prepared him. Thank you for all your time and energy to make Appletree Academy a great place for our children to learn!" Copyright 2016 Appletree Academy Preschool. All rights reserved.